LaStone Therapy®, "The Original Hot Stone Massage" is trademarked style of massage that uses both hot AND cool marble stones to massage the body. While cool stones may not sound appealing, they feel refreshing on your warmed skin and have a beneficial effect. LaStone Therapy is similar to, but not exactly the same as hot stone massage, hot rock massage. LaStone use 54 hot stones, 18 marble stones, and one room temperature stone. LaStone can only be performed by someone who is certified to be a LaStone therapist. This is good because insufficient training is sometimes a problem with hot stone massage. LaStone was developed in 1993 by Mary Nelson, a massage therapist and native of Tucson who began to get visions and verbal guidance from her Native American Spirit guide. "With each day's work, I was intuitively led to use more stones, and developed a method of progressively opening up the energy channels (Chakras) of the body," she says. The idea quickly caught on and was adapted to become hot stone massage, a treatment that is now found in almost every spa. LaStone involves a more spiritual or metaphysical component than simple hot stone massage. LaStone Therapy begins with deep breathing from the belly. You sit up and the therapist places two rows of warm stones and when needed, cool marble stones on the treatment table in alignment with both sides of your spine. The therapist covers them with a soft towel to protect you from the heat, then, assists as you lay back down on them. The therapist will then places stones of varying weights on the body's key energy channels, including the seven main chakras. Warm stones are placed between your toes and medium-sized flat stones are placed in your palms. The therapist use's the stones as an extension of his or her hand, massaging the body as trails of heat flow deep within the client's body, flowing from the feet to the legs, and swirling all over the back, lingering long enough to melt the tension from each muscle. The stones give immediate comfort of warmth and relaxation the minute they touch your skin, alternating between heat and cool stones both stimulates and relaxes the circulatory system, which is very detoxifying for the body. In cooperation with heated stones, chilled marble stones create a dramatic movement of fluids within the body. Personally, I've had many mediocre hot stone massages, where the therapist was literally "heavy-handed" with the hot stones. It's not that easy for the therapist to maintain their sensitivity of touch with a big rock in their hand! And the body can start to overheat. The best hot stone massage is LaStone Therapy. A Therapist who is trained with LaStone is highly skilled with the stones, able to create a rhythmic flow of heat in which the stones come to life in the therapist's hands, allowing the therapist to work at a deeper level.  It's the best, high quality Stone Massage you will ever experience. As always, speak up if anything is uncomfortable during your LaStone Therapy massage.